It is always useful to compute column percentages for bivariate tables. But, it is also useful to have a summary measure – a single number – to indicate the strength of the relationship. Cramer’s V is used for tables larger than 2x2. 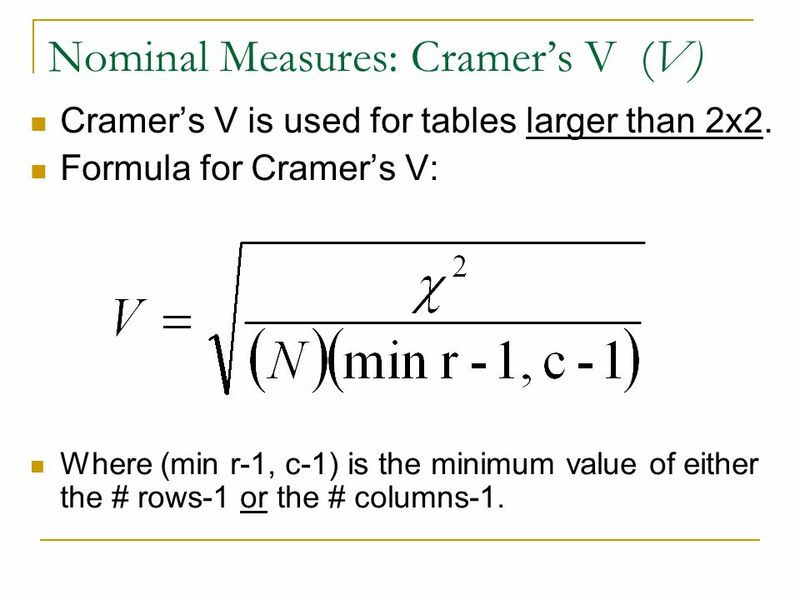 Formula for Cramer’s V: Where (min r-1, c-1) is the minimum value of either the # rows-1 or the # columns-1. 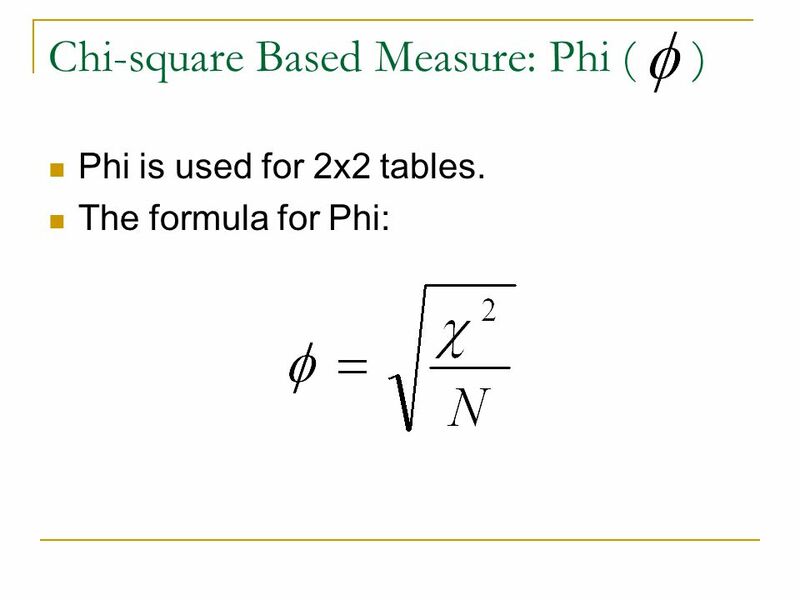 Phi is used for 2x2 tables only. 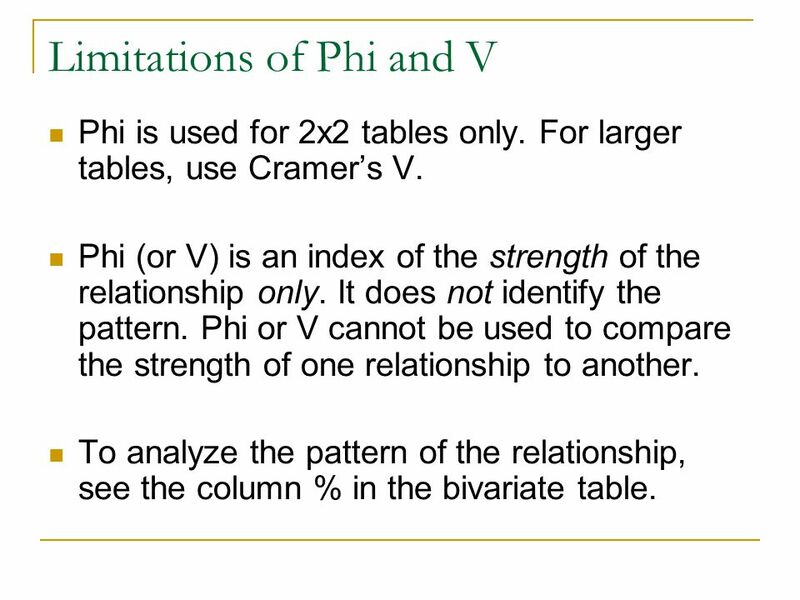 For larger tables, use Cramer’s V. Phi (or V) is an index of the strength of the relationship only. It does not identify the pattern. 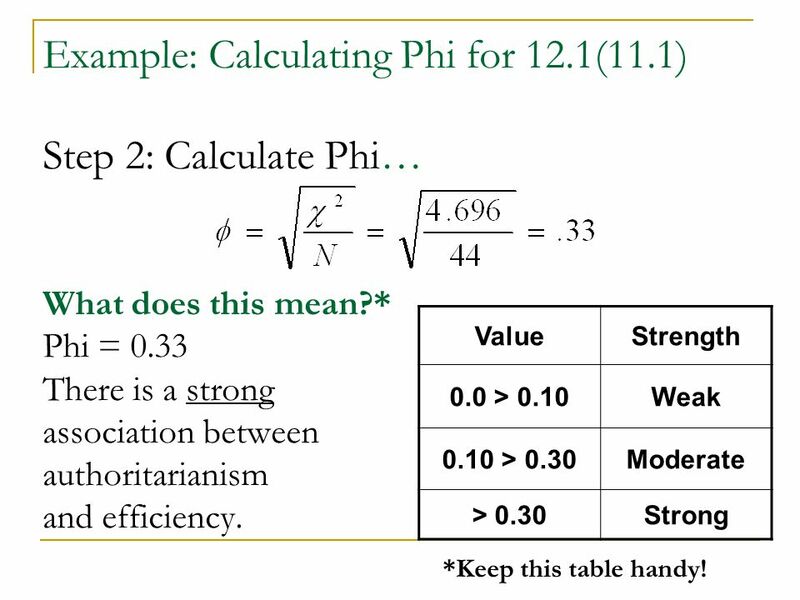 Phi or V cannot be used to compare the strength of one relationship to another. To analyze the pattern of the relationship, see the column % in the bivariate table. 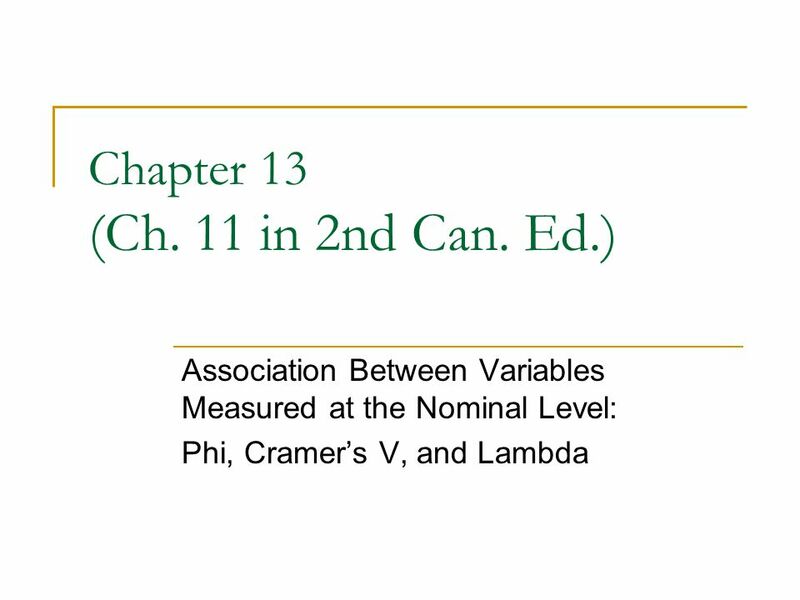 Like Phi and V, Lambda is used to measure the strength of the relationship between nominal variables in bivariate tables. It can also be used to compare one relationship to another. 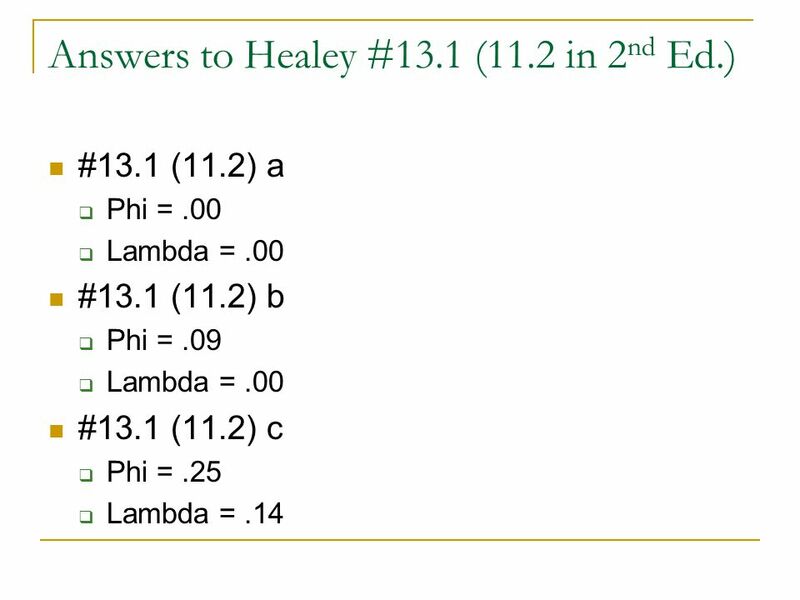 Unlike Phi and V, Lambda is a PRE measure and its value has a more direct interpretation. 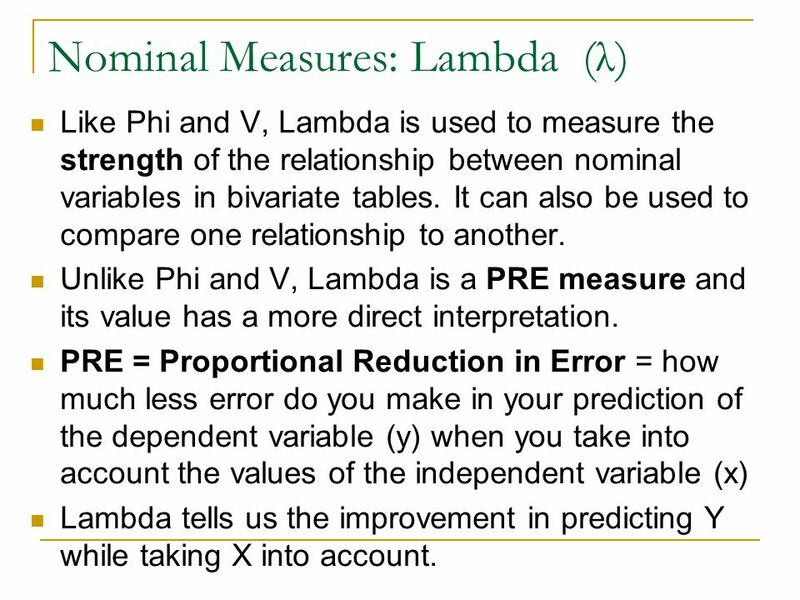 PRE = Proportional Reduction in Error = how much less error do you make in your prediction of the dependent variable (y) when you take into account the values of the independent variable (x) Lambda tells us the improvement in predicting Y while taking X into account. 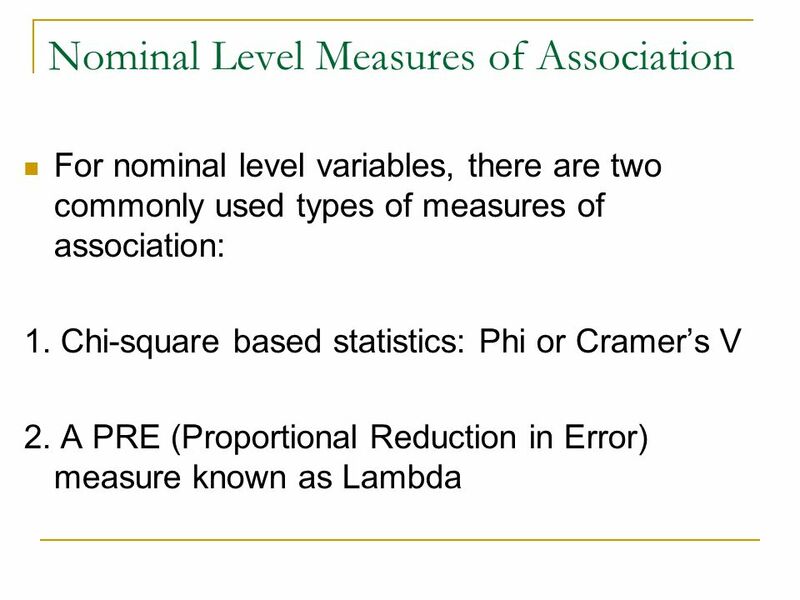 Lambda is a PRE measure. 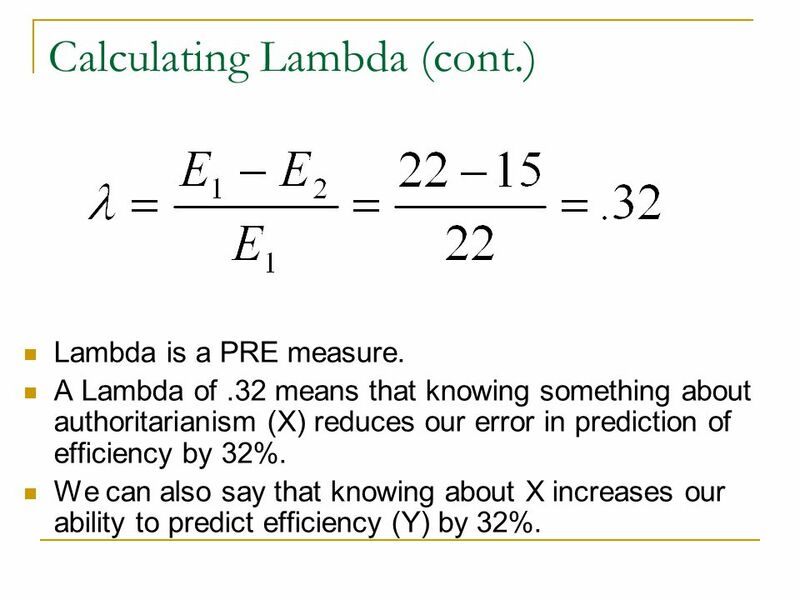 A Lambda of .32 means that knowing something about authoritarianism (X) reduces our error in prediction of efficiency by 32%. We can also say that knowing about X increases our ability to predict efficiency (Y) by 32%. 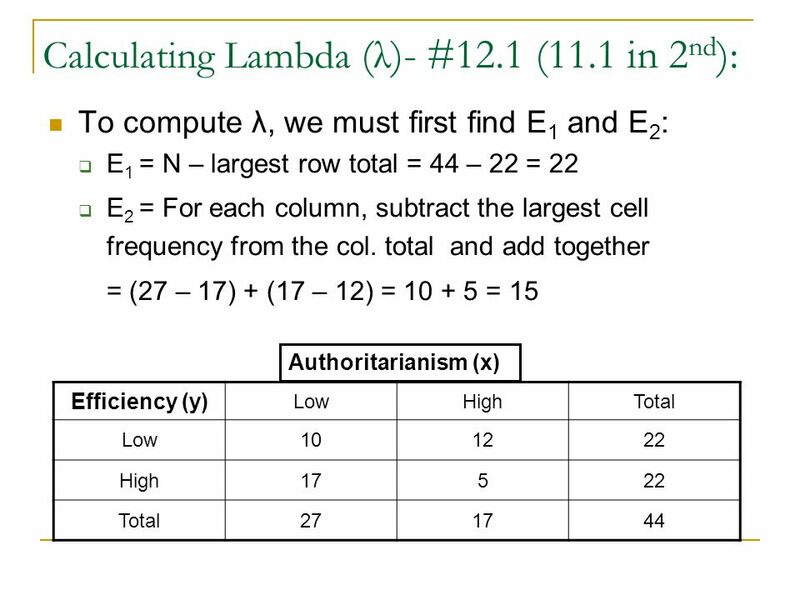 13 More about Lambda (λ) The values of Lambda vary from 0.0 – +1.00, where 0.0 is very weak and 1.00 is very strong. 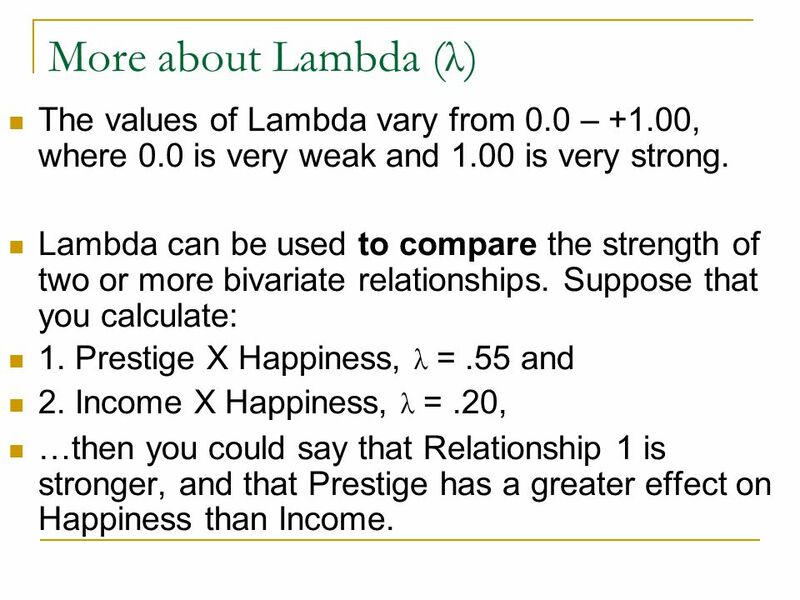 Lambda can be used to compare the strength of two or more bivariate relationships. Suppose that you calculate: 1. Prestige X Happiness, λ = .55 and 2. Income X Happiness, λ = .20, …then you could say that Relationship 1 is stronger, and that Prestige has a greater effect on Happiness than Income. 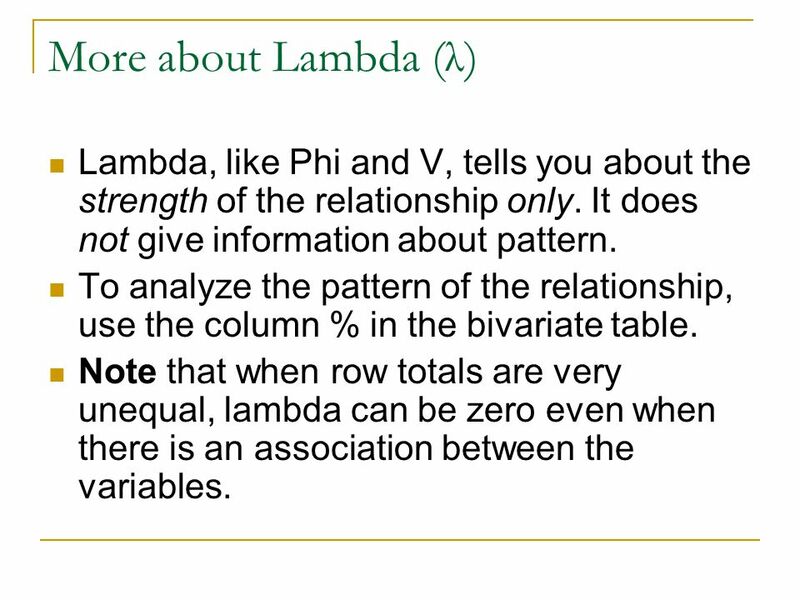 14 More about Lambda (λ) Lambda, like Phi and V, tells you about the strength of the relationship only. It does not give information about pattern. 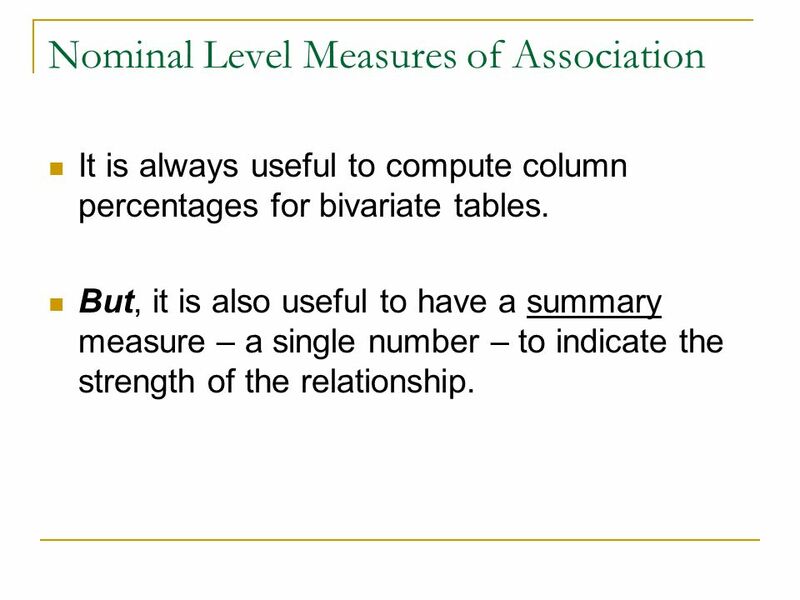 To analyze the pattern of the relationship, use the column % in the bivariate table. 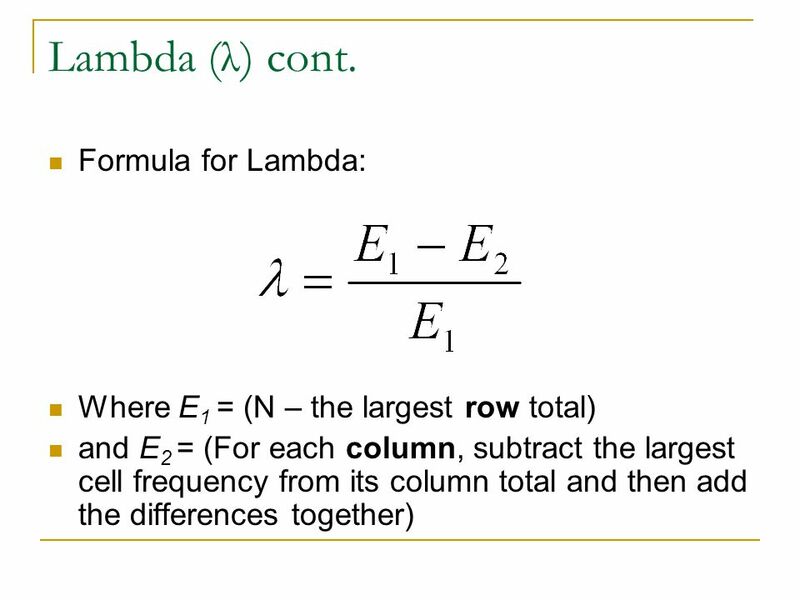 Note that when row totals are very unequal, lambda can be zero even when there is an association between the variables. 15 Answering the “Three Questions” when working with Nominal Level Variables. 1. “Is there an association?” can be answered by looking at the % and by doing a test of significance like Х2. 2. 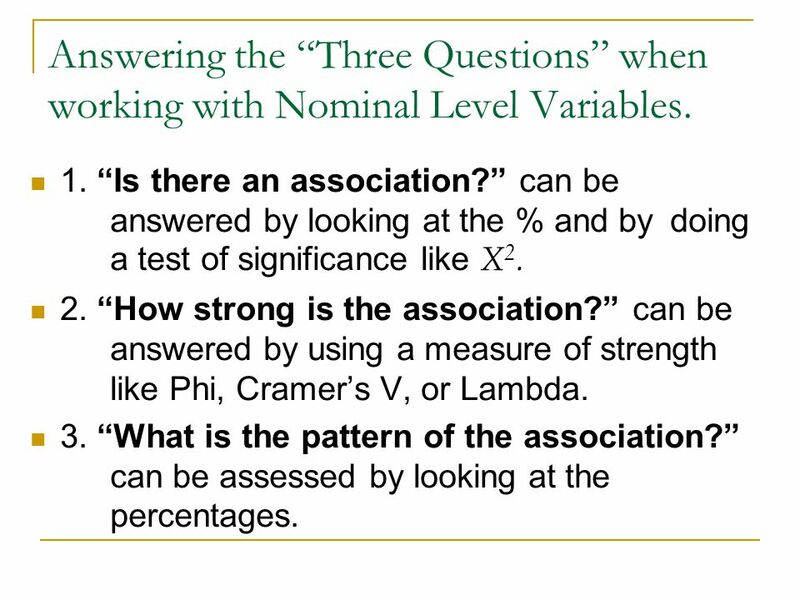 “How strong is the association?” can be answered by using a measure of strength like Phi, Cramer’s V, or Lambda. 3. “What is the pattern of the association?” can be assessed by looking at the percentages. Work with a partner on question #13.1 (a,b,c) and find an answer to all three of the above questions Answers are on the last slide. Compare the three relationships, and use Lambda to evaluate which relationship is the strongest. Write a brief summary of your findings. Download ppt "Chapter 13 (Ch. 11 in 2nd Can. Ed.)" 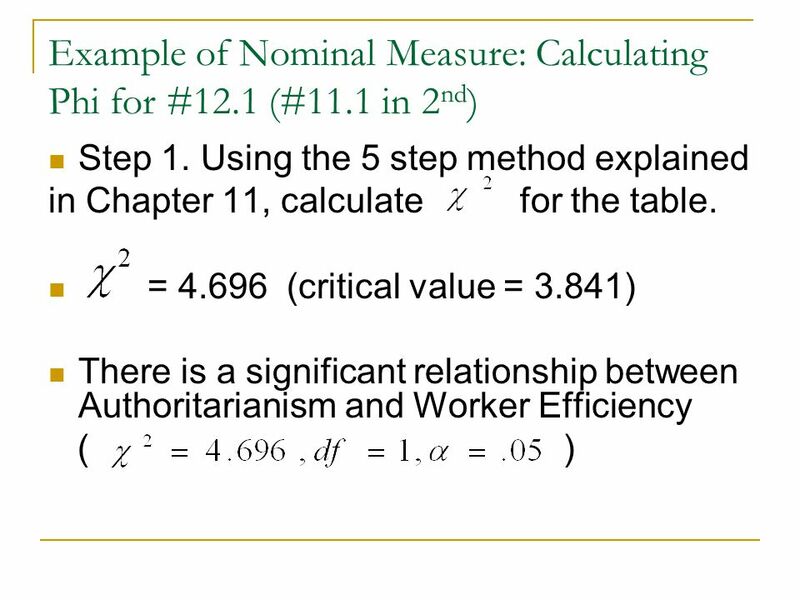 Chapter 12 Bivariate Association: Introduction and Basic Concepts. Copyright © 2011 Pearson Education, Inc. Association between Categorical Variables Chapter 5. © The McGraw-Hill Companies, Inc., Chapter 12 Chi-Square.